For the family with kids reaching the driving age and having their own cars, parking can often become an issue. Playing musical chairs with the family vehicles shouldn’t have to be an evening affair, nor should rock, paper, scissors decide who is parking in the street that night. This simple 3-car garage offers a solution to these problems by providing an answer to the family with too many cars and too few places to put them. If new family drivers are not the source of your parking troubles, this garage plan also lends itself to the family with a weekend car. Now you no longer have to sacrifice parking your daily travel car outside while the weekend roadster enjoys the shelter. The garage itself includes options for an 8’ ceiling or a 9’ceiling while three individual garage doors provide entrance for each vehicle separately. Finally, a door located on the side of the garage allows for it to be easily connected to a house by a walkway. 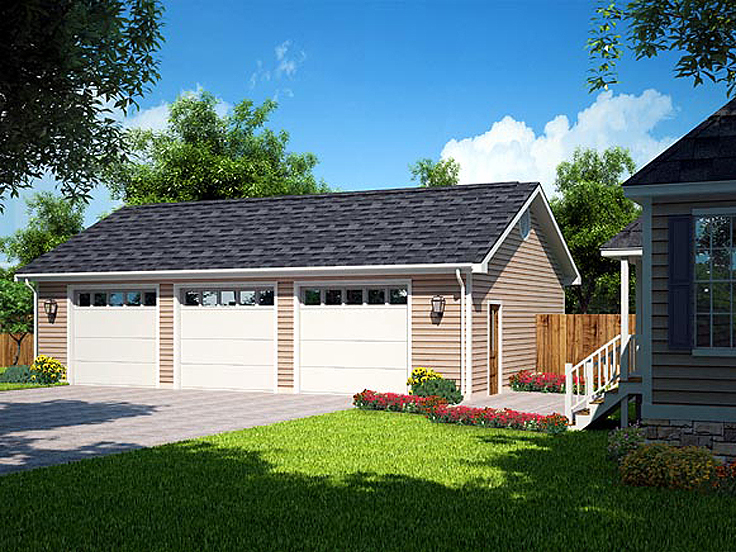 View more plans like this one by browsing our collection of 3-car garage plans.